Asthma is a complex chronic condition that over 20 million people in the U.S.struggle with each day. While there is no cure for asthma, it is a treatable condition. By taking appropriate and proactive measures, individuals with asthma can lead very full and active lives. 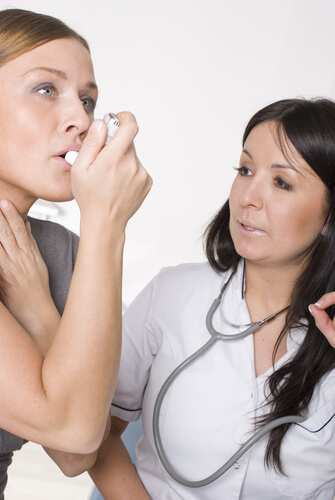 Asthma can most basically be described as a lung disease. It is caused by inflammation in the airways that lead to the lungs – the bronchial tubes – which become blocked or narrowed. In healthy individuals, these airways are usually not swollen or clogged with excess mucus, however, when asthmatic individuals encounter an asthma trigger, their bronchial tubes respond by becoming inflamed and produce excess quantities of mucus. This inflammation and excess mucus makes breathing very difficult and can cause temporary shortness of breath, coughing, wheezing, rapid breathing, and chest tightness. Sometimes breathing becomes so difficult that death can occur. There are two main types of asthma: allergic (extrinsic) asthma and non-allergic (intrinsic) asthma. Those with extrinsic asthma typically experience inflammation in their bronchial tubes when they inhale certain environmental triggers. Individuals are sensitive to a variety of environmental triggers, but most asthmatic individuals respond negatively to pollen, household cleaners, perfumes and other fragrances, dust mites, pet dander and mold. But why are some individuals susceptible to developing asthma and others are not? While the science behind asthma triggers is well understood, researchers are not yet certain what determines why some individuals develop asthma and others do not. Genetics are obviously involved; asthma tends to run in families. However, the exact mechanisms by which asthma develops remain unclear. Of course, understanding why some individuals develop asthma and others do not, does not help suffering asthmatics find relief. Anyone looking for relief from their symptoms should begin by consulting with a healthcare practitioner to obtain professional treatment. However, avoiding environmental asthma triggers is a great way to reduce the need for medication and to prevent future asthma episodes. This can be implemented with a few simple steps. 1.) A good place to start is with the bedroom. Dust mite barrier covers should be used for pillows and mattresses; preferably made from 100% certified organic cotton. 2.) Besides the bedroom, the bathroom and kitchen often have high concentrations of asthma triggering agents. Only all-natural, unscented cleanersshould be used in the bathroom and kitchen. Most conventional cleaners – besides being toxic – contain high concentrations of irritating, synthetic fragrances which can create additional problems for asthma sufferers. 3.) Asthmatic individuals should also take a good look at their water supply. City water typically contains high concentrations of chlorine. Chlorine is excellent at killing harmful bacteria, but chlorine and its by-products can easily irritate the lungs. To prevent lung irritation, all chlorinated water should be filtered; even bathing water. 4.) Besides water, laundry detergent is an often unrecognized source of asthma triggers. Most laundry detergents contain high concentrations of irritating fragrances. Asthmatic individuals need to make sure that they use only all-natural, unscented laundry detergentin their homes. They should also avoid the use of dryer sheets which can be heavily doused in synthetic fragrance. 5.) Asthmatic individuals should they vacuum their homes regularly with vacuums equipped with HEPA filters. This will help ensure that dust and pollen tracked into the home are quickly removed from the air before causing problems. Asthma can be a challenging condition for many, but if asthmatic individuals make ongoing efforts to reduce their exposure to environmental asthma triggers, especially triggers found in the home, they can go a long way towards improving their quality of life.